Show your support for the Gaelic Athletic Association in Ireland. Irish Eyes carries a range of Licensed Apparel bearing the GAA Logo. Stop by Irish Eyes and check out the quality, premium fabrics used and the active lifestyle designs that make these products unique in both quality and design. Royalty payments from the sale of these products, goes to the AA Community in Ireland enabling local clubs to benefit in a very real way. Through the purchase of Licensed GAA goods you are supporting Ireland’s National Sports. In the early years of Gaelic Football games were played between different parishes, and could last for hours on end. Wrestling was part of the game until people complained that the game was too rough. Wrestling was not allowed after 1886.
that is 3 points or over the bar for one point. However prior to 1895 a goal was 5 points.The games length varied also, from 60 minutes to 80 minutes and nowadays 70 minutes. The All-Ireland Final (our super-bowl) is always played at Croke Park. Irish Chieftains supported the game and paid players to be on their team. 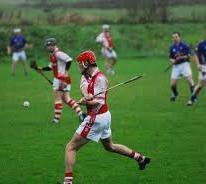 An Puck Fada is a competition whereby the hurler will cover a distance in as few strokes as possible. Some believe this is how golf originated. Today hurling is stronger in Munster than in any other part of Ireland although you will find clubs and counties participating all over the country. The number of players and scoring is similar to Gaelic Football. The All-Ireland Hurling Final is always held in Croke Park. The Gaelic Athletic Association The G.A.A. The Gaelic Athletic Association was founded in Ireland in 1884 by Michael Cusack and Maurice Davin to allow ordinary Irish people to compete in athletics and to revive interest in our National sports. It included Gaelic Football, Hurling, Camogie (ladies hurling) and handball. The GAA now has over 350 clubs outside of Ireland. There are over 4,000 registered players in North America. You can also find Gaelic Football being enjoyed in China, Australia, New Zealand, Saudi Arabia, Thailand, and all across Europe.